At the June 8 match between the Phoenix Mercury and the Indiana Fever, the WNBA introduced a new camera that put viewers incredibly close to the action on court. Made by Broadcast Sports Inc., the “ref cam” is a small camera that takes video from the referee’s perspective. 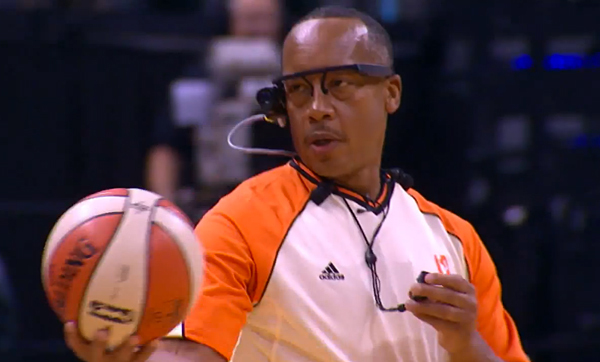 Referee Lamont Simpson got first dibs on the wearable camera. I’m sure his whistle was highly insecure that day. And here’s a bonus clip from ESPN, showing Simpson calling a technical foul: Edit: ESPN made the YouTube video private. Sorry guys. Simpson said that he found it awkward at first. He said that he had to keep on adjusting the headset the entire first half because it moved around when he became sweaty. But he also said that he got used to it by the second half. Simpson can’t get too attached to it just yet though, because for now the ESPN and the WNBA will decide when the ref cam will be used. They should make pro golfers wear these so we can all tune in for some in-your-face walks in beautiful parks.